Well it is not that long now till we go on our yearly two week bike tour. This year we are going to the Vosges and Alsace regions of France. Loads of ruined castles and some small mountain passes this year, Helen wants a rest from the big stuff this year. 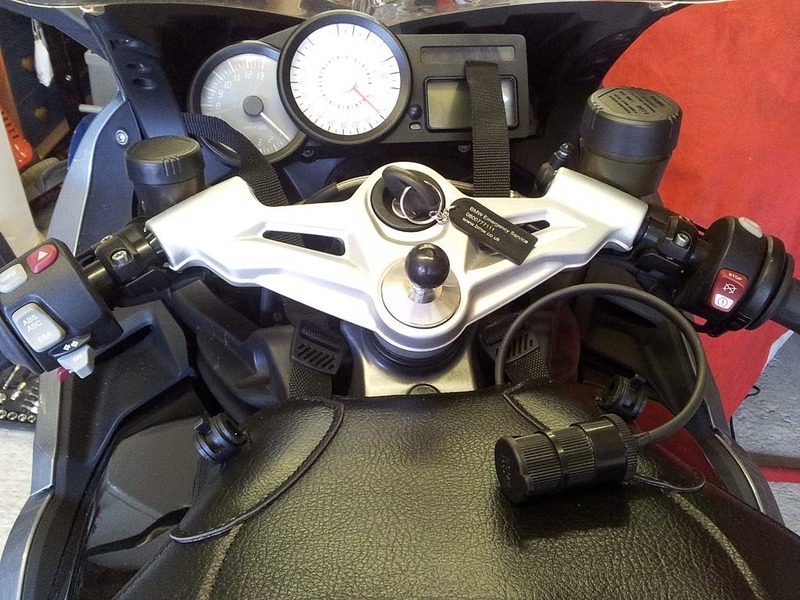 So I thought it was about time to install the Autocom and SatNav system on the K1300s. Then we have a few weekends left to test it before we go off on our trip. The major problem with the BMW is that there is virtually no room under the seat. 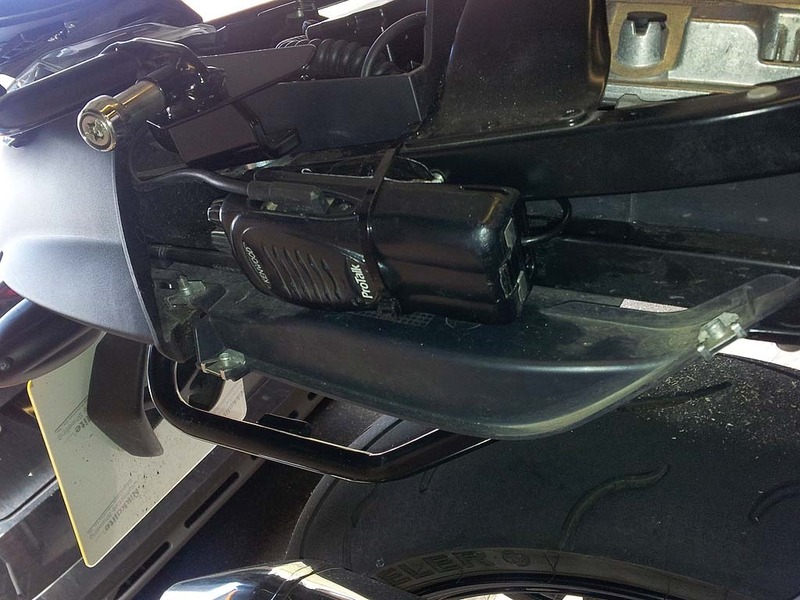 The small amount of room that it does have on standard models has been filled with the electronic modules of the extras that my bike has. However I did find that behind both rear seat cowls was enough room to mount things. Obviously because four screws are holding on each cowling I need to make it a permanent install. This meant that I needed to get some kind of 12v power pack supply for the Kenwood TK3201 radio. The new models from Autocom provide this feature now but mine doesn’t and there is no way to retrofit it. After a brief search Ebay came to the rescue as usual and I managed to find what I needed on there. Whether this is a decent product or Chinese rubbish only time will tell. I mounted the Autocom main unit under the left rear seat cowl, there are holes in the trim underneath so this should provide cooling and if water gets in drainage. 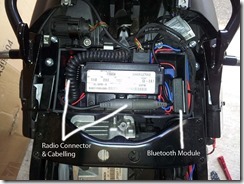 I was able to mount the BTM-02 Bluetooth module under the seat as it is only small. This is handy because occasionally you need to press the reset button on it to repair the Bluetooth connection. I installed the Kenwood TK3201 radio under the right rear seat cowl, where it just about fits. 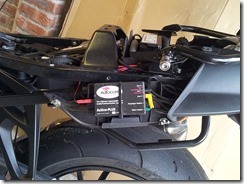 I got the 12v supply for the radio power pack from the back of the 12v socket on the side of the bike. This is fed off the Canbus system so will automatically power off after the key is taken out of the ignition. 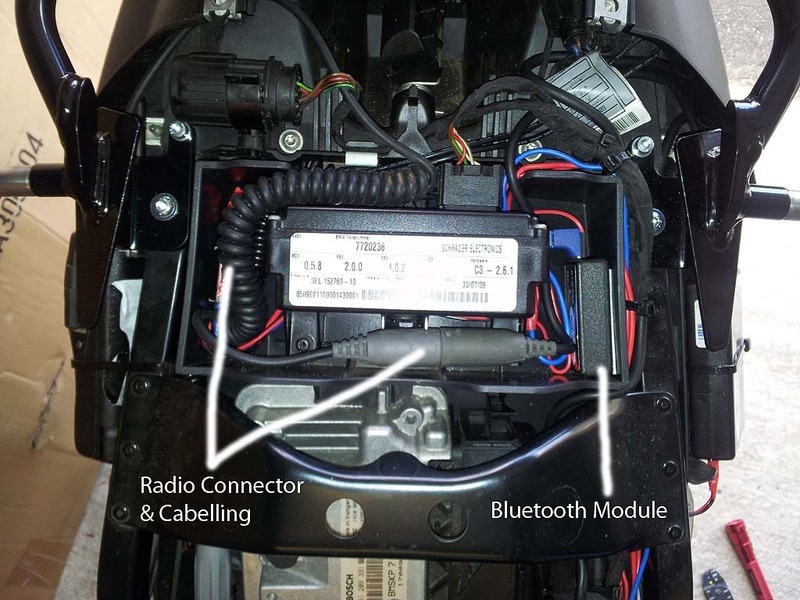 I initially powered the Autocom unit from the Canbus socket in front of the battery that is designed for the BMW SatNav system. However I was getting very loud engine noise through the unit. So I then powered off the same supply source as the radio pack. But I was still getting engine noise through it. 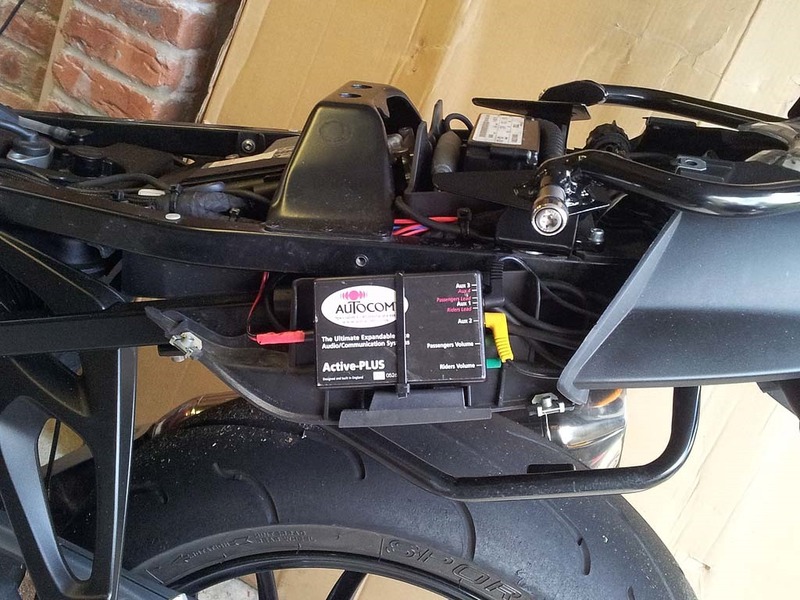 After a quick search on the internet it was apparent that the Autocom ground should be connected directly to the battery. So I disconnected the ground from the socket and ran in a separate ground wire from the battery and thankfully this solved the problem. After a quick test I was happy that everything was working as it had done previously on my old VFR. The Sat Nav I have is a TomTom GoLive 750, although it is made for a car I have never had any problem using it on a bike and in my opinion is far better than the TomTom Rider. After a quick search on the internet I came across a nice ball ram mount that screwed into the headstock. I managed to save myself a few pennies and got a used one off Ebay, it is a real quality mount. It is called the Telferizer and is available only direct from the manufacturer and they are made specific to each bike model. I used my old tried and test case to hold the SatNav in and powered it from a USB charger fitted in my tankbag. This is turn is supplied from the bike via the Canbus BMW SatNav socket conveniently located under the battery cover. I gave it a quick test and everything was working well with the directions coming through load and clear in stereo via Bluetooth through the Autocom unit. I occaisionally visit your blog to take a look at what you are upto and noticed the Normandy Photos from 2008. Enjoyed flicking through them and especially like the one of Rachel and I on top of a rain swept gun emplacement at point du hoc. Not out on the bike as much these days (3 year old daughter now) but I have recently returned from 4 days in Holland on the bike and I still like to pootle about on it when I can. Nice to here from you Ian, glad to here you are still riding. Yes it was a little wet but not as bad as the previous day. We are off to the Vosges on the 18th of this month for our annual bike tour away.